Both © Terry Stapley 19 July 1988 - used with permission. Two tonight both on the Plymouth Tavistock run. Top we have LFJ871W in the smart blue and cream livery which really suited these wonderful buses, this one on the X84 which I think gave a slightly quicker direct run to Tavistock. 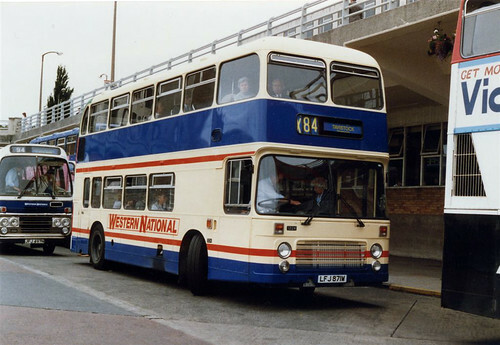 Just in front is the rear end of an East Lancs Olympian with Plymouth Citybus - they didnt stay long in Plymouth! Below this we have Plymouth Citybus 91 on the 84 to Tavistock. 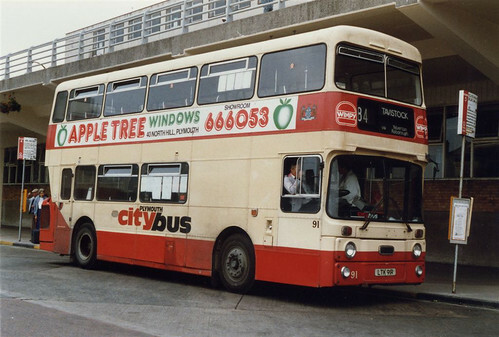 I am sure this was part of the local bus wars between the two operators at this time as I cant really remember Citybus running on this service at any other time.